Our board-certified Minneapolis eye doctors have completed years of rigorous surgical and medical training and are among the founders of the Phillips Eye Institute, one of the leading ophthalmic care hospitals in the country. This is also the location where many of our eye surgeries are performed. We currently have eight ophthalmologists and two optometrists, as well as a staff of nearly 50 highly skilled technicians, opticians, and certified ophthalmic care personnel. The highly trained eye doctors, physicians, technicians, and staff of Eye Care Associates are dedicated to improving and preserving the sight of our patients in a personalized, caring environment. 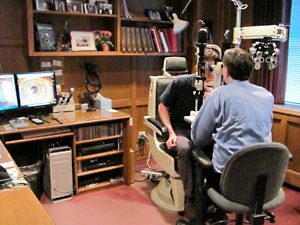 Eye Care Associates, P.A., was formed in 1995 in Minneapolis, but we have a history of practicing ophthalmic care services that dates back more than 35 years. Our board-certified physicians have completed years of rigorous surgical and medical training and are among the founders of the Phillips Eye Institute, one of the leading ophthalmic specialty care hospitals in the country. This is also the location where many of our surgeries are performed. We currently have eight ophthalmologists and two optometrists, as well as a staff of nearly 50 highly skilled technicians, opticians, and certified ophthalmic personnel.